On March 15, Uzbek President Shavkat Mirziyoyev signed a decree reducing the staff of the Uzbek Prosecutor General’s Office (PGO) by 23 percent. In effect, that will lead to the departure of 1,198 PGO professionals, the most senior of which are two deputy prosecutor generals in charge of to-be-abolished departments. Not all the cut PGO employees will be out of jobs, however; the State Tax Committee, Cabinet of Ministers, and President’s administration will absorb around half of those departing. Such major restructuring is not a frequent occurrence in the public administration of Uzbekistan. At the same time, Mirziyoyev’s regular criticism of public employees and their lack of work culture has been significant. A similar previous exodus took place in December 2017 when 562 Finance Ministry employees were sacked after Mirziyoyev’s harsh evaluation of the ministry. Among the three PGO departments to be abolished and transferred, the largest is the tax and customs department. Its 470 employees are to become a part of the State Tax Committee. The department for protecting the rights of business entities and its 87 employees will be transferred to the office of Business Ombudsman under the president. The PGO’s Inspection of Agriculture Industries and Food Security department established only a year ago will be transferred to the Cabinet of Ministries. Overall, the changes will bring down the number of PGO employees from 5,363 to 4,165. 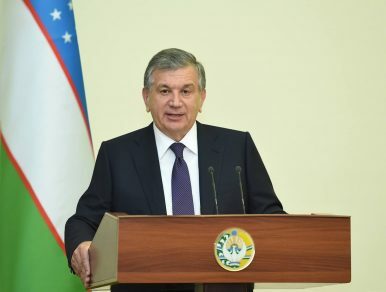 Immediately after Mirziyoyev’s rise to office, prosecutors along with governors, regional tax officials, and the interior minister became the president’s major focus. This “quartet,” as the president dubs them, have to collaborate to extend state reforms at the regional level. Mirziyoyev regularly comments that these regional “quartets” are his representatives in the regions. More recently, in January, the Head of the Prosecutor General Academy Evgeniy Kolyenko assured that the PGO of the past and the PGO of the present are two different entities. According to him, not only had the organization shifted toward being a crime prevention body, but had already achieved almost universal zero tolerance to bribes and liquidation of channels to the abuse of power and corruption within the organization. Despite that reported good health of the organization, a close reading of the March 15 decree outlines Mirziyoyev’s discontent with the PGO and provides a number of explanations for the restructuring. The decree explains that the proposed measures are directed to better protect entrepreneurs and small business owners, improve the investment climate, and streamline the PGO’s functioning. Furthermore, the decree makes clear that entrepreneurs and small businesses are the overarching concern and therefore, a trigger for the latest changes. It could be that PGO’s unsatisfying performance in this area and a loss of trust in the PGO as a fit body to create a favorable environment for entrepreneurs precipitated the cuts. In February, Mirziyoyev requested prosecutors and tax officials in the country to adopt the approach of protecting entrepreneurs and small businesses. He warned the same officials to change their attitude from punitive to collaborative, particularly in regards to tax collection. In what seemed a specific demand toward prosecutors, Mirziyoyev requested to cease punishing entrepreneurs for the duration of adjustment to the recently adopted tax rules and become advisers and supporters. The cuts to the PGO proposed by the president are unquestionably a significant event in the governance of Uzbekistan given how infrequent such changes happen despite attempts to reform on a grand scale. Such major reshuffles usually precipitate directly from Mirziyoyev’s discontent. In the past, the president called on the PGO to work for the benefit of the people, but that is probably something the PGO couldn’t deliver either due to institutional or capacity constraints. This development also highlights the president’s consistent focus on the country’s business environment in a concerted attempt to make it more favorable to entrepreneurs and investors.